Since we couldn’t go to the Friday show, I passed the tickets along to my son’s Godparent’s daughter. Maybe I should run a contest with the winner being the person who can figure out that relation…lol. Anyway, M and her friends had a blast, as evidenced by the cute teenaged, girly photos she posted to Facebook. Saturday, Atlanta Dad and I got a sitter and descended sans kiddos upon Piedmont Park around 4pm, thinking that we’d be in the older crowd and certainly the minority based upon our experiences nearly a decade ago when we last attended Music Midtown. We were immediately and pleasantly surprised by the many changes that have been implemented since the MM of the 2000’s that have obviously made it an event people over 25 would actually want to attend. We saw families, middle-aged folks, and multi-generational groups of people sprawled out on blankets enjoying conversation and refreshments. There was plenty of room for everyone to move fairly quickly and easily between the two stages or to plop themselves in the middle of the lawn (like we did) so they could enjoy performers in either location without moving back and forth. Now, I’m not gonna lie, the porta-potties left much to be desired and the 30 minute long lines left many desperate, and therefore willing to find “alternative urinating locales” by the end of the night. Also, I have yet to attend a concert where the smell of marijuana and the glimpse of a joint or paraphernalia isn’t a part of the experience. It’s just a fact, and while it’s never been my thing, I was no goody-two-shoes in high school/college and I’d be lying if I said I was shocked by or oblivious to the fairly widespread indulgence that Florence and The Machine and Pearl Jam fans engaged in. 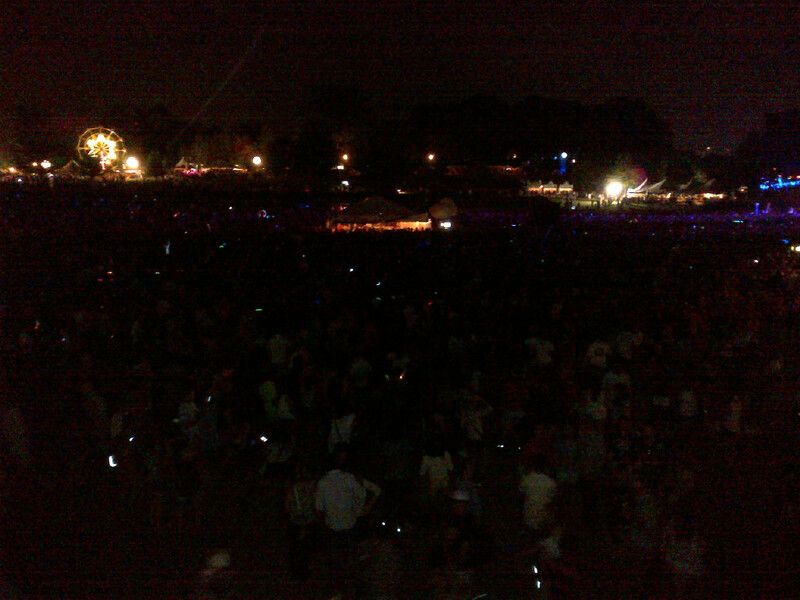 A little history- Music Midtown ran in Atlanta each year 1994-2005, and was brought back in 2011. We attended in both 2004 and 2005 as engaged young adults and then newlyweds. Since we had just moved to Atlanta in the Spring of 2004, we really got into the festival back then, and living in Midtown at the time made it uber-convenient, too. During its initial years, the festival would sometimes draw 300,000+ attendees. It began as a two-day event with three stages. Later it grew to three-day event. At that time it had six main stages! The huge crowd and damage to the park as a result are rumored to be the real reasons (more-so than decreasing attendance) for the hiatus later that decade. 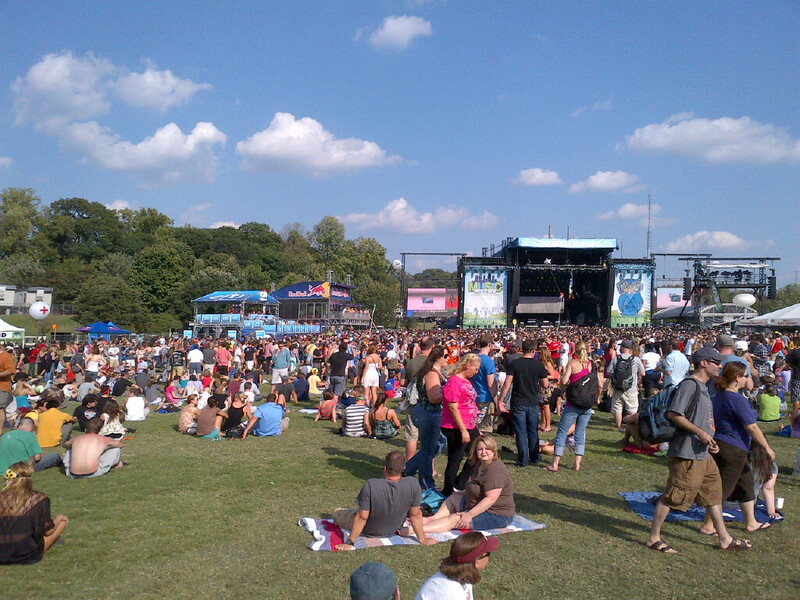 Last year, in 2011, Music Midtown returned as a one-day event, with only two stages. The festival again offered two stages this year, but expanded across two days. Big names like Foo Fighters, Garbage, Pearl Jam, and Ludacris drew a sell-out crowd. Originally I had read that the festival would be capped at 55,000 people, but it was announced during Pearl Jam’s show on Saturday night that attendance was counted at just shy of 53,000 people, so they must’ve stopped selling tickets a little early. According to the Music Midtown website, sales were closed at 4:20pm Saturday. While peeing in a portable toilet and being pushed around by drunk 22 year old girls isn’t the way I’d want to spend every weekend, I am really happy to say that those incidents are memorable because they were such a small part of my experience at Music Midtown. Overall, we found the vendors, servers, musicians, and the crowd itself to be a diverse group of people who were there to enjoy themselves, the beautiful weather, and lovely park, as well as some awesome musical talent. We spent most of our evening hanging out with friends who are also Penn State alumni and parents. In fact, they have kids the age of our boys- except that their playmate for L2 is actually a set of triplets his age! 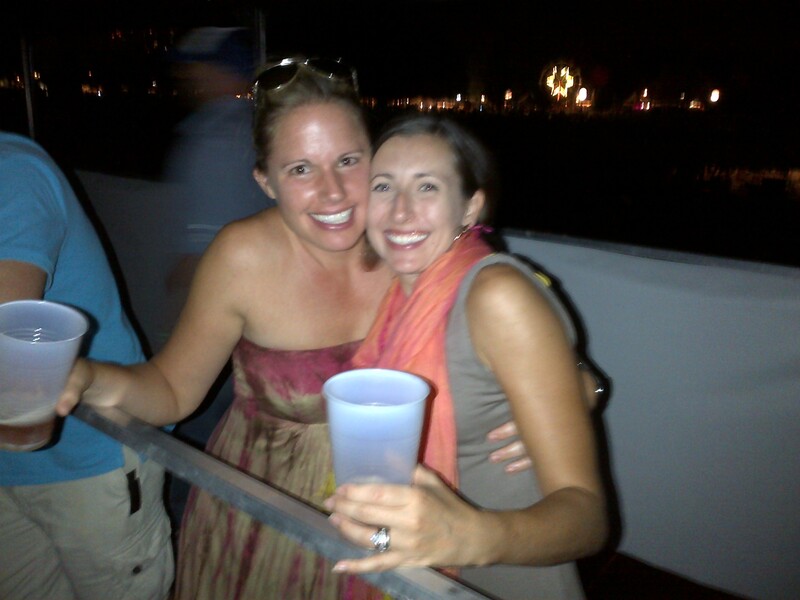 The mom to The Trips, my good friend K, and I are pictured below enjoying a well-deserved Mommy’s night out. Pardon the blurry photo. This photo was taken from the second story of a mobile bar that was serving Sweetwater– a local beer. While our view of Pearl Jam left us far from being able to see Eddie Vedder’s face up-close, the gorgeous view of the stage and crowd, and the huge screens on either side of the stage kept us singing along to Jeremy and Evenflow, nevertheless. While we didn’t ever make it over to the Ferris Wheel, you can see the lights that it and the other tents and attractions surrounding the festival area added to the night-time atmosphere. As you consider attending in the future, I definitely recommend buying early-bird tickets to the event and/or registering to win tickets- there were a lot of opportunities to do so floating around Facebook and Twitter for a couple of months prior. One tip from several of my friends who attended as a family; leave smaller children at home. Every single one of them mentioned that their kids weren’t very interested and that potty-breaks and trying to keep track of little people in the crowd wasn’t too much fun. 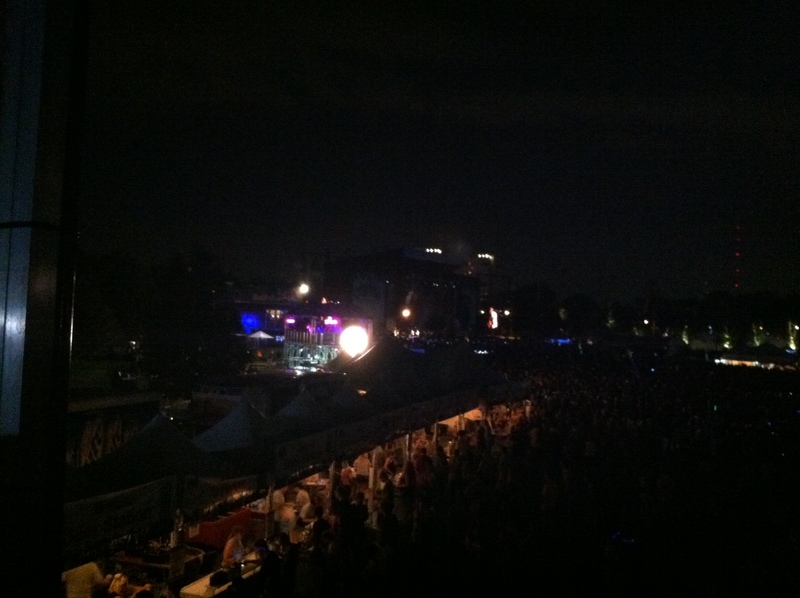 Overall, Music Midtown was a good time…even for this almost middle-aged Atlanta mom! Who says soccer moms can’t rock?